Like most gardeners this time of year, the majority of my gardening time is spent on my knees. Weeds are making their annual attempt to overtake beds and borders. (Now that I think about it, though, perhaps I should say weeds are continuing their perennial attempt to overtake the place.) Currently, my primary focus is on ridding the garden of bittercress (Cardamine spp.). The bittercresses are charming, innocent-looking weeds with dainty, four-petaled flowers. Wait too long to pull them, though, and they catapult seeds everywhere for next season’s crop. Thus far, I must have eliminated seeds for at least a million of next spring’s seedlings. 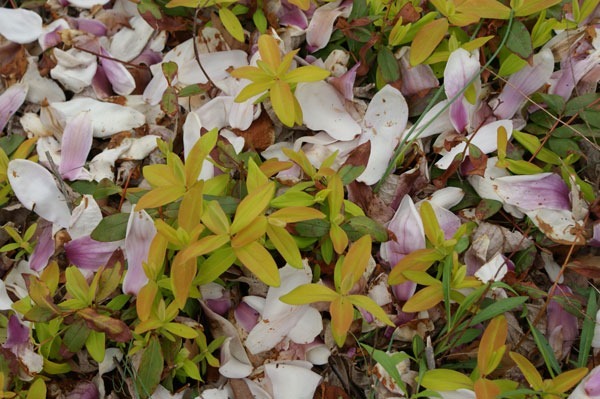 ABOVE: Hypericum calycinum ‘Brigadoon’ with magnolia petals. But, I didn’t start this post to write about weeds, despite the amount of time I am devoting to them. We have a large saucer magnolia (Magnolia soulangiana) in the backyard that has been lovely this year. I especially appreciate its flowers once they begin to fade. As the blooms break apart, they scatter a deep blanket of white petals blushed with pink all over the hillside behind the house. And while I barely notice their fragrance when they are fresh and still on the tree, once petals coat every surface, it is simply marvelous. Perhaps the scent is more noticeable because I am spending so much time working on my knees, but whatever the reason, the petals and their fragrance create a memorable combination in the garden. 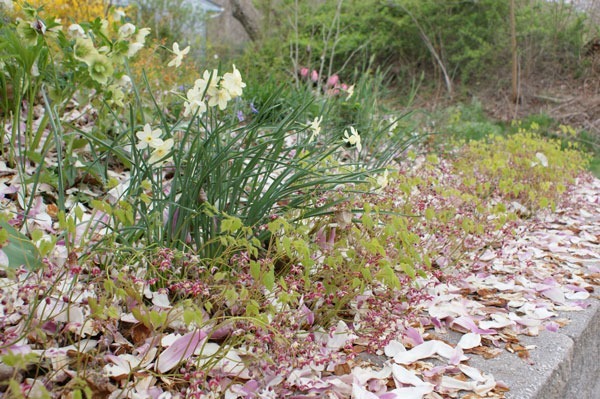 ABOVE: Epimedium rubrum mulched with magnolia petals. 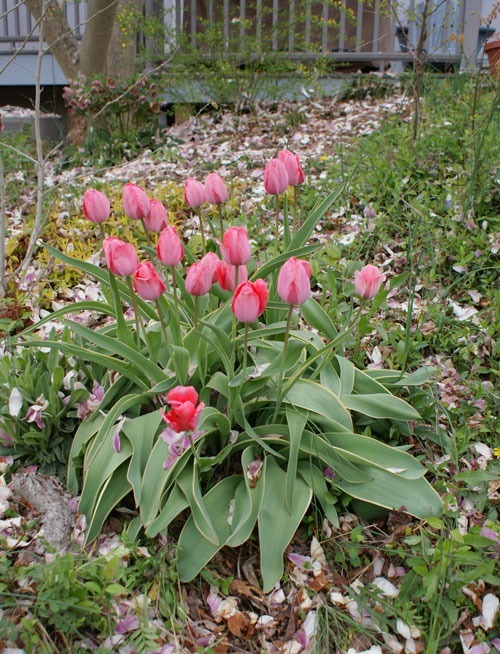 ABOVE: Tulips with magnolia petals. This is a long-lived clump with leaves edged in yellow. If I can find the label when it is done flowering, I will post the name.